Well, Councilman Zeke Cohen finally got a response to his request. Last month, he asked for Baltimore to conduct an independent, comprehensive rate study to justify imposing another 30% water rate increase on citizens. Yesterday the city released a summary of a consultant’s report – 25 days after Cohen made his request and six days after the Board of Estimates approved the increase. “The public should have been presented with this information and DPW’s plans for infrastructure projects well in advance of seeking a rate increase,” said Cohen, who had first approached DPW director Rudy Chow about the rate study on December 21. 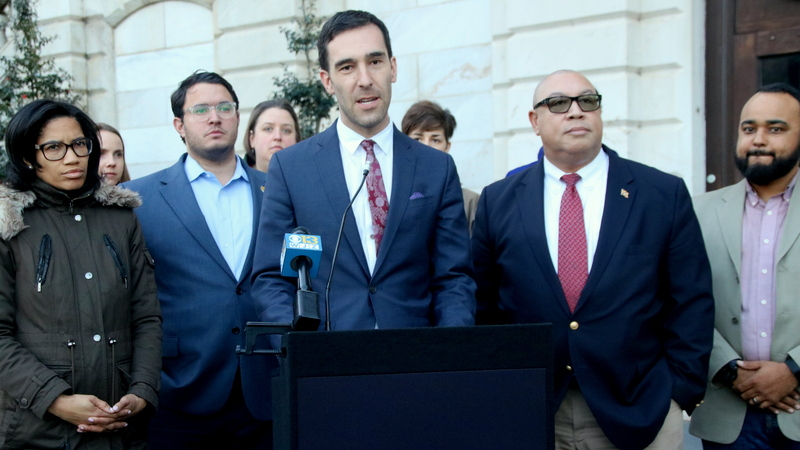 Speaking outside of City Hall the day before the rate hike vote, Cohen and four fellow Council members renewed his plea to hold off on raising water rates until more information could be provided. Standing with them were advocates who said the last 30%, three-year rate increase had been a hardship for citizens, especially those with low incomes. Another three years of rising bills, along with billing inaccuracies, they warned, would add to customers’ struggles, prompting tax sales, homelessness and residents leaving the city. The increase passed 3-2. Voting for it were Mayor Catherine Pugh and her two appointees, City Solicitor Andre Davis and DPW Director Rudy Chow. But the administration’s victory came with still more criticism from elected officials inside the building. Before voting “no” (along with Council President Bernard C. “Jack” Young), Pratt complained that, like Cohen, she had repeatedly requested information from DPW. But it “was never received,” she said. It was unclear, however, whether Pugh had, prior to voting “yes,” seen the three pages of text and three charts from Raftelis. A spokesman for Young said he had not seen the Raftelis report until it was released yesterday. “The release and publication of the Raftelis Financial Planning Study Summary in support of the approved rate increases for Water, Wastewater and Stormwater services to Baltimore City users, helps all of us to understand the requirements of and assumptions made to develop the revenue and expenditure projections for the next three fiscal years. As a result of the information provided in the Summary, the Department of Audits will design an audit plan focusing on the revenues, expenditures, reserves, related construction projects and other areas that will provide management a tool to improve operations and efficiencies. Further, the audit, which will begin in the Spring, should assist in determining that the level of the approved rate increases are reasonable and whether the assumptions supporting future rate increases are also reasonable. The report, which is described as forming the basis for increases that will go into effect on July 1 of 2019, 2020, and 2021, includes information on water, sewer and stormwater project needs, as well debt service and ongoing operational expenses. But it lacks specific projections for particular infrastructure projects. One thing it does show is continuing healthy surpluses from the latest rate hikes, confirming what Baltimore Brew gleaned from reports required to be issued to bond buyers by the U.S. Securities and Exchange Commission. In the current year, FY2019, the water and wastewater cash balance is $129 million. By FY2022, the cash balance is projected to be $166.4 million. This represents a 29% increase after paying off operating expenses, capital expenses and bond interest for new projects. The report also shows an increasing reliance on PAYGO bonds based on cash coming from annual water and sewer revenues. PAYGO borrowing is projected to increase from $20 million currently to $72 million in future years, another indication that DPW will maintain a significant cash balance. The Raftelis report, signed by executive vice president Jon Davis, and perhaps more precisely referred to as a transmittal letter, also addresses DPW’s water customer assistance program. H2Assist, which was also approved by the Board of Estimates last week, is intended to help income-qualified residents (those at or below 175% of the federal poverty level) with paying delinquent water bills. Another point made by the Raftelis study may come as a harsh irony to water customers who conserve their usage – they may be paying a price for it. Because people in Baltimore, as elsewhere in the country, are using less water due to the prevalence of low-flow fixtures and high-efficiency appliances, among other measures, future rate hikes won’t go as far as they used to. “It is important to note that the impact of projected rate increases is dampened by the assumption of continued decline in metered water usage,”the report says.